Agricultural engineer, commodities trader, mechanic, quasi-veterinarian: all of these skills describe the farmer, one of the backbones of America. If you talk to a farmer you’ll find that he is extremely brand loyal on one particular point: what type of equipment he owns. When I first got to know my father-in-law, Marlin Cassel, a Lancaster County farmer, I quickly learned that there was only one brand of equipment that could till the fields, plant the corn, bail the hay, and fill the silos to his satisfaction. It announced itself as green and yellow. Marlin spent his working career as a farmer and still cultivates the fields today. And he’s pledged his loyalty to John Deere. What does John Deere stand for in his mind? It represents the family history of farming, the way he put food on the table for 50 years, the way his father put food on their table. It represents what it takes to get the work done. It represents the struggle to rebuild after a barn burnt to the ground. It represents a bumper crop of corn. It represents the pride of being a farmer. 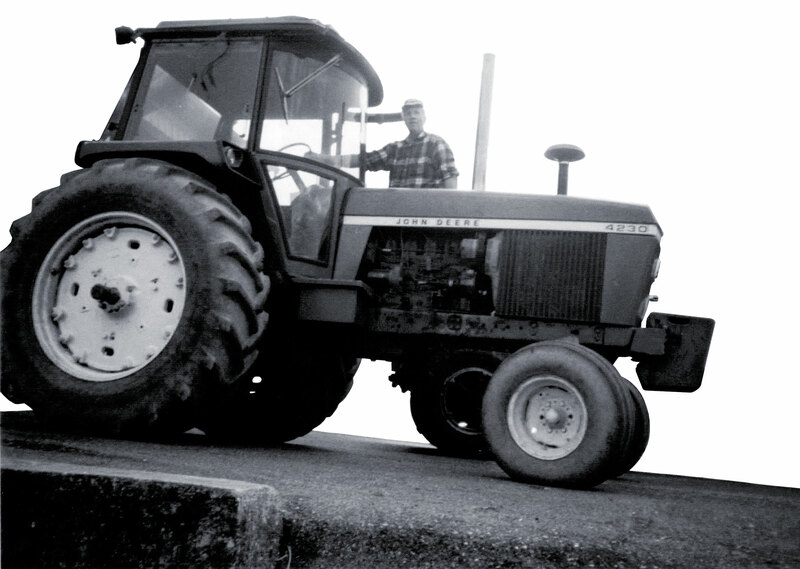 A Model 4230 purchased in 1976, proudly poses with its owner Marlin Cassel. When Marlin is in the market to buy a new tractor, he’s not actually shopping tractors, he’s shopping John Deere. Marlin was sold on John Deere years ago. He is simply taking action on that decision when he buys new equipment. What’s your John Deere? Is there a product or service by a specific company that you wouldn’t consider doing without? How did that happen? How does brand loyalty develop? Often a company will focus on how to get customers to be loyal to them. Brand loyalty grows, however, when brands are loyal to their customers. When brands are devoted to customers, customers reciprocate: they rave about the brand, the story grows, and the message spreads. The cycle keeps going. What are you doing to become the big green tractor in the field? What loyalty commitments have you made to your customers? What do you love about your customers? What are the key differentiators of your business or organization that are unique to you and no one else in your space? How can you demonstrate your loyalty to your customers? If you can’t answer these questions, start by listing your bottom line promises to your customers. Are you delivering those commitments and how are you communicating them? Building brand loyalty may sound like a large initiative that you don’t have time or resources to tackle, but remember that a brand is always evolving. It exists whether you have chosen to intentionally influence it or not. Be deliberate and choose the level of commitment, whether great or small, that is right for you and dedicate that time and effort to your brand’s development.